My good friend, Julie gave me a gag gift at Christmas: yellow labrador socks. It was meant to be funny, and it was. The running gag is my self-imposed distance from her yellow lab named Stella. It’s not that I hate dogs and cats; it’s I don’t get pet ownership. Rather than try to convince me of my errant ways, Julie just make fun when she can. I liked the gag gift and decided to do the right thing by wearing them once for her sake. Packing for Italy, I threw them in the luggage to add a little variety to my wardrobe there. Little did I realize how much they would impact my journey. When I arrived at my Teramo destination, the home of my second cousin, Maria Pia Mascherini, the iron gates to her drive way opened, and I was greeted by her yellow lab named Dylan. I began to wonder if this is just how my life is; a yellow lab waiting for me wherever I go. I told Maria Pia about Julie’s Dylan look alike in New York City named Stella and even went so far to show her Stella’s Twitter page, Stellathedognyc. Smiling laughs all around. One day, I decided to wear the yellow lab socks. Maria Pia bolted straight back and then pressed the picture of the dog on the socks saying “Dilll onnnn”. Now she wanted in on the gag. We walked to her sister and brother-in-law’s house next door. After the usual kissing greeting (both cheeks, first right, then left), Maria Pia started pointing to my socks. The older couple laughed and said, “Dilll onnnn”. It turns out the pet really belongs to their daughter, and Maria Pia cares for it. It is just strange how the simplest gesture can make such an unexpected impact. The downside is now my Italian cousins think I’m one of those “pet goofy” people I write about. Your Host, Anthony “Masch” Mascherino, Sr. Most Americans searching for the ultimate wine experience fail to find it on traditional Italian vineyard tours. Avoid this classic mistake and study at the feet of an industry giant. 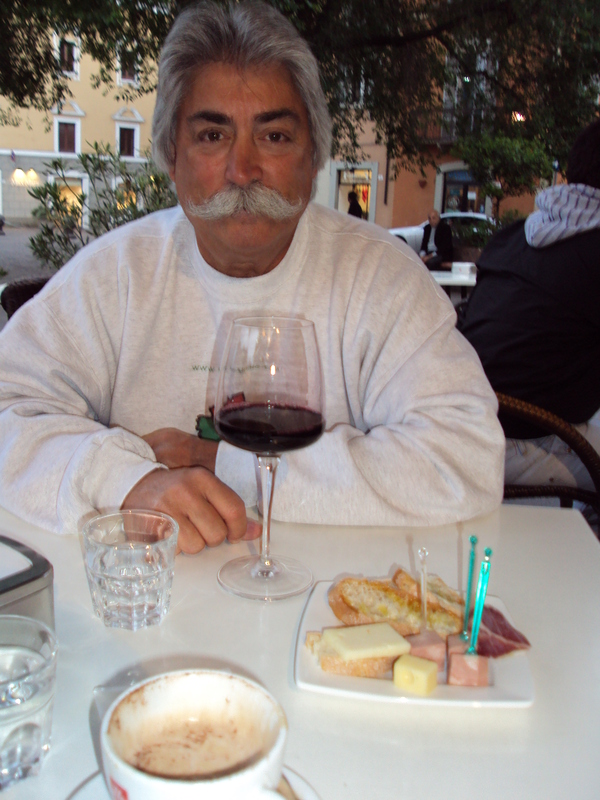 On the Masch Ombrelloni Vino Crawl, you will be guided on the wine tour of a lifetime by one of the industry’s most respected guides: Anthony Mascherino, Sr. Known in America and Italy simply as Masch, your congenial host has extensive skills doing umbrelloni wine crawls. Although Masch is not yet bilingual, he always gets the wine to flow your way. On your quest for wine enlightenment, you and a select few will follow Masch on the search for umbrellonis at wine bars, snack bars and side street restaurants. It is here where you will sample the finest local products sold to vendors at their peaks. This creative tour disstains bumpy bus rides followed by boring vineyard lectures and goes straight to sipping the finished products. Your Euros are spent only on the enjoyment of the wine craftsman’s products and also directly supports the local wine industry. Your tour includes the eternal city: Rome; a world class sea resorts: Positano; and charming Abruzzo towns: Teramo and Torino Nouva. On these tours, you won’t be slowed down by snooty analasis of wine differences. Masch teaches his historical “Tutto bon” principle: It’s all good; there is no bad wine. Learn what an ombrelloni is – oversized sidewalk umbrellas. Learn to pronounce ombrelloni. Sorry, you must take the tour to get it right. Hone an instinct for spotting them everywhere you roam. Develop a flashing desire for wine with an ombrelloni sighting. The final cost of this tour is augmented by Masch’s magical speed at picking up checks. To book your special Masch Ombrelloni Vino Crawl, contact us at www.masch_vino_crawl.com or just sit under an ombrelloni until Masch shows up. Note: this will happen. It’s fairly simple to indentify Americans from Italians. Americans wear good looking jeans and so-so footwear. With Italians, it’s the opposite. When I went looking for English speaking people in Italy, I’d listen to how they talked. If it didn’t sound like music, they were Americans or Germans. My choice for the most mellifluous word in English is elbow. Say it by caressing each letter and maybe you’ll hear its beauty: el b o w.
It is far surpass by the Italian word for “Pleasure to meet you”: piacere. Properly said it is “pyah-CHAYR-ay. It just rising from the lips and sounds so smooth. I used it endlessly when I was in Italy. When I got it right, it made for good moments. Una parola dei ringraziamenti ai nostri parenti italiani. Li avete preso nelle vostre case e li avete curati ai buoni periodi durarli per le nostre vite. Sarà duro da cominciare scegliere chiunque perché mancare chiunque sarebbe errata. Cominciamo ringraziando il nostro cugino caro, Maria Pia Mascherini per l’apertura la sua casa a noi ed essendo un’assistente di volo notevole. Non solo ha provveduto ai nostri bisogni ma era davanti noi sempre. Sarà sempre nei nostri cuori. Sarà la persona che pensiamo circa ogni volta che chiunque accenna l’Italia. A Joanna ed a Guido D’ Adamo, Maria Pia’ sorella e cognato di s: Abbiamo goduto della nostra chiamata a vostra casa il 19 maggio. Era divertimento per parlare delle nostre famiglie e per vedere che cosa una vita charming entrambi conducete. Il dio lo ha ricompensato con una buona vita. A Monica D’ Adamo, figlia di Joanna e di Guido: Eravate un’assistente di volo charming durante la nostra chiamata a Roma. Avete regolato i nostri agendae ed avete aiutato quando la lingua ha fatto i problemi. Eravate abbastanza gentile humor con un giro su misura dell’automobile della città. Senza vostro aiuto, Roma non sarebbe stata tan divertimento. Al & di Louisa Mascherini Pompelii; Vinceo Pompelii: La vostra casa è riempita di famiglia e di amore. Il vostro tempo con noi era prezioso e toccante. Può il sorriso del dio sui vostri figli, sul derivato nella legge e sul nipote. MiMi a Mascherini, incontrarlo era come la visita con il nostro MiMi caro Mascherino da Downingtown, PA. Potrei vedere quanto interessato eravate nelle nostre famiglie in America mentre abbiamo raccontato le storie voi. Potete avere buona salute per il resto della vostra vita. Ai nostri due cuginos: & di Vittorio; Mauro Pompelii che era sempre attuale aiutarlo quando lo abbiamo avuto bisogno. Siamo stati impressionati da quanto gentile eravate quando avete offerto l’assistenza. Era Vittorio che lo avrebbe prestato un calcolatore per la mia chiamata e li avrebbe presi intorno alla zona di acquisto di Teramo. È un uomo che ottiene il rispetto dove va mai. A tutti: Lunghi in tensione e li visitano. Speriamo soltanto che possiamo fare lo stesso lavoro meraviglioso avete fatto per noi quando visitate l’America. A word of thanks to our Italian relatives. You took us into your homes and treated us to good times to last us for our lives. It will be hard to start to single out anyone because to miss anyone would be wrong. We start by thanking our beloved cousin, Maria Pia Mascherini for opening her home to us and being a remarkable hostess. She not only provided for our needs but was ahead of us at all times. She will always be in our hearts. She will be the person we think about whenever anyone mentions Italy. To Joanna and Guido D’Adamo, Maria Pia’s sister and brother-in-law: We enjoyed our visit at your home on 19 May. It was fun to talk about our families and to see what a charming life you both lead. God has rewarded you with a good life. To Monica D’Adamo, daughter of JoAnna and Guido: You were a charming hostess during our visit in Roma. You set our agendae and helped when language made problems. You were kind enough to humor us with a customized car tour of the city. Without your help, Roma would not have been as much fun. To Louisa Mascherini Pompelii & Vinceo Pompelii: Your home is filled with family and love. Your time with us was precious and heartwarming. May God smile on your sons, daughter in law and grandson. To MiMi Mascherini, meeting you was like visiting with our beloved MiMi Mascherino from Downingtown, PA. I could see how interested you were in our families in America as we told stories to you. May you have good health for the rest of your life. To our two cuginos: Vittorie & Mauro Pompelii who were always at hand to help us when we needed it. We were impressed by how gracious you were when you offered assistance. It was Vittorie who would lend me a computer for my visit and take us around the Teramo shopping area. He is a man who gets respect where ever he goes. To all: Live long and visit us. We only hope we can do the same wonderful job you did for us when you visit America. Today was my yearly trip to UPenn’s memory center. I go through a series of test both mental and physical. I’m doing this work to create benchmarks in my life to satisfy the curiosity of the people doing the Alzheimer’s research. After this abuse, I’ll treat myself to a lunch in Philly’s Chinatown. My goal was to walk the 30 blocks to a restaurant Moe and Sandy Green prefer. I wanted to eat there and then let them know I did so. At about the 29 block milestone, I had no choice but to go into another restaurant to use their mens room. I made the decision to eat there in exchange for the kindnesses shown me. It’s called Ocean Harbor http://www.yelp.com/biz/ocean-harbor-philadelphia#hrid:S-MrLVQVsuOf6mZ1nIE4gg and it’s a scant 1/2 block from my usual dim sum mecca: Rising Phoenix. This change of events put me into a new experience which is where I often like to be. As I stood in the queue area waiting, I noticed there were no other Westerners. The fact I was there made no ripple in the large open room. I also saw what I like to see at dim sum restaurants: ladies wearing white aprons pushing stainless carts filled with “little treats”. I was starting to feel this my serendipitous choice had the makingof a good thing. As I ate myself into a dim sum zone, I noticed a trend. All of the tables with new diners were first visited by the same server who started me out. Then she was followed by the other waitresses in the same order I experienced. I wondered if the house had a rigid plan on the order of service. I noticed more savvy diners didn’t wait for the servers to visit them. They’d raise themselves from their chairs and make beckoning gestures to the servers they wanted. They had a way to bypass the preset order of services. If you find yourself in Philly’s Chinatown and want an experience equalling Hong Kong’s dim sum, go to the Ocean Harbor. It touches all my bases for dim sum. Cost this day with tip = $28.00 and worth it. Entries (RSS) and Comments (RSS).19 queries. 0.346 seconds.